Chula doesn’t do any tasting with us, but she does take in the experience. Our favorite tour is of the wineries in Châteauneuf-du-Pape, about an hour to the north of our village, Saint-Rémy-de-Provence. 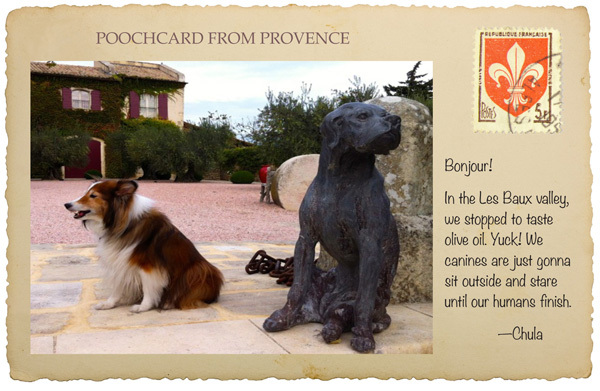 We always stop at the Mont Redon winery because Chula has a dog friend, a cute spaniel, there in the tasting room. They sniff around outside while we taste, and then we take them both for a walk around the rows and rows of grapes. It’s hard to trot through the vineyards, though, because the soil is so rocky. In fact, in this area where irrigation is not allowed, big rough rocks serve to hold in the natural rainwater and the heat. And that means the rocks keep dogs out! The views from the perimeter, however, are striking. 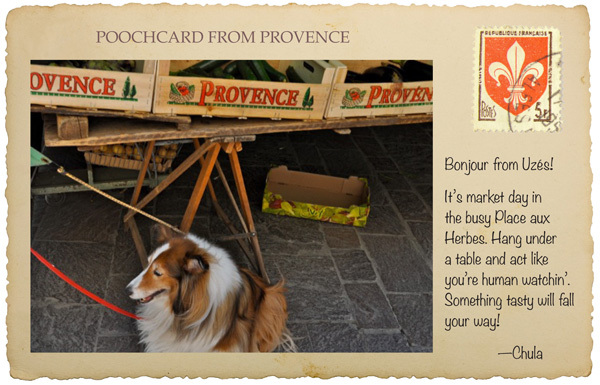 One reason to live in Provence is simply the delicious taste of fresh food. We grow herbs and vegetables in our kitchen garden, or potager, and also buy produce at the big Provençal markets. On small chalkboards, market vendors label the source of their vegetables. To make sure we get the freshest of the fresh, we look for the word Pays (Country), which means the vegetables were grown in France. While it’s hard to believe from a dog, Chula likes vegetables, too. In fact, she loves the French tomato so much that she has been caught stealing them from our garden. It’s no surprise, then, that she will also visit the vegetable vendors in the markets. Sausage may be her passion, but she’s not going to turn down a tomato that falls her way. Rivaling the vineyards in Provence are the stretches of gray-green olive groves that treat the eye and produce a beautiful golden olive oil so essential to the healthy Mediterranean diet. In the Les Baux Valley just south of Saint-Rémy, we find olive oil that suits our taste at the Château d’Estoublon. Chula, however, is not so keen on the idea of olive oil. Good thing, because she’s not allowed inside this tasting room! For us, it may be the light (as so many impressionist painters have said) or the sights from peaceful villages or the rich traditions of French culture. For Chula, it must be the smells, the tastes of stolen tomatoes, and the chance to be with us—in restaurants and shops, on village walks or hikes in the hills—everywhere! 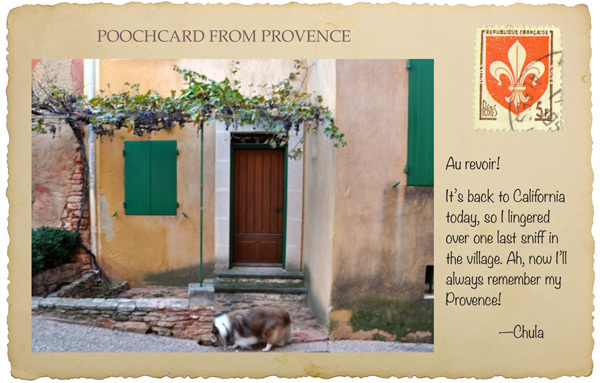 But whatever it is, we have found that Provence is a place we all treasure. 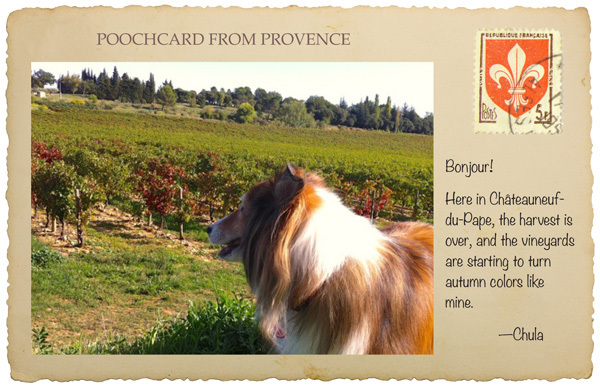 When it comes time for us and our traveling dog to leave for California, we say our goodbyes, and find ways to remember Provence until we are back again. Au revoir!